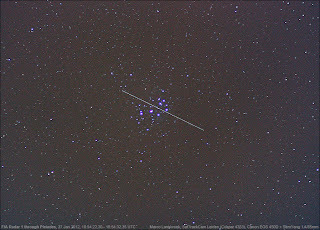 The picture above (10s exposure taken with a Canon 450D and SamYang 1.4/85 mm lens) shows the classified military Radar reconnaissance satellite FIA Radar 1 (10-046A) sailing smack through the Pleiades last Friday. Friday evening started clear, and I took the opportunity do so some observing. 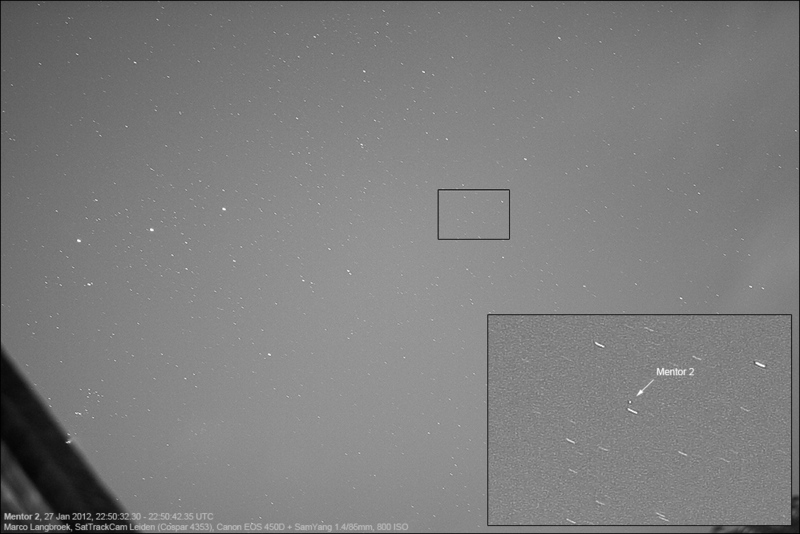 Using the SamYang 1.4/85 mm and the Carl Zeiss Jena Sonnar MC 2.8/180mm, I not only obtained the picture of FIA Radar 1 above, but I also targetted some geostationary satellites, imaging several of them in Orion. Among the targets were the classified military communication satellite Milstar 5 (02-001A), the SDS data relay satellite USA 227 (11-011A) and the SIGINT satellite Mentor 2 (98-029A). Two other classified objects were captured as by-catch of these objects: the SIGINT satellite Vortex 6 (89-035A) and the object "Unknown 110623" (11-674A), an amateur-discovered object in GTO that is probably a spent rocket booster of a military launch. Note how it created a tiny trail in the image below as it was moving northwards through Orion. The images below show these objects. Milstar 5, Vortex 6, UNK 110623 plus the two non-classified commercial communication satellites Eutelsat W2 (98-056A) and Intelsat New Dawn (11-016A) are all in the same 10-degree wide 85mm image. 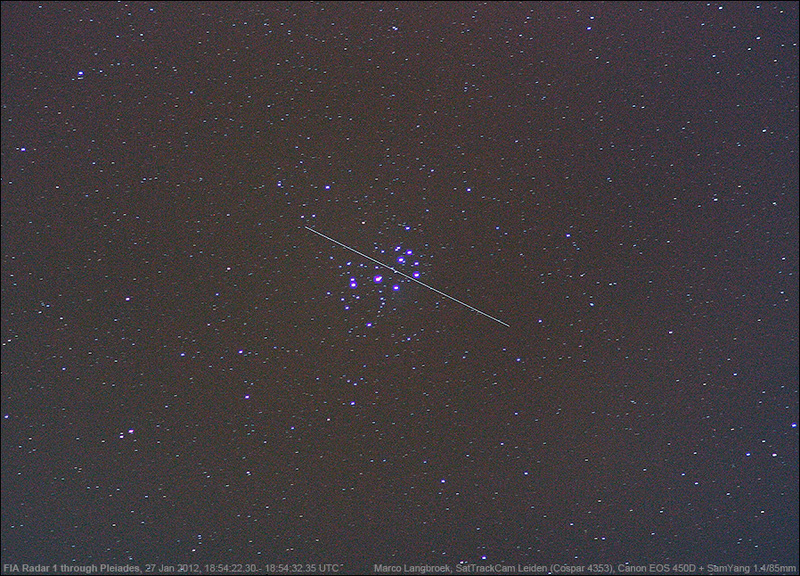 The stars of Orion's belt are visible in the top of the image, and Milstar 5 is close to the Orion Nebula. Orion's belt stars are visible at left in the Mentor 2 image as well. 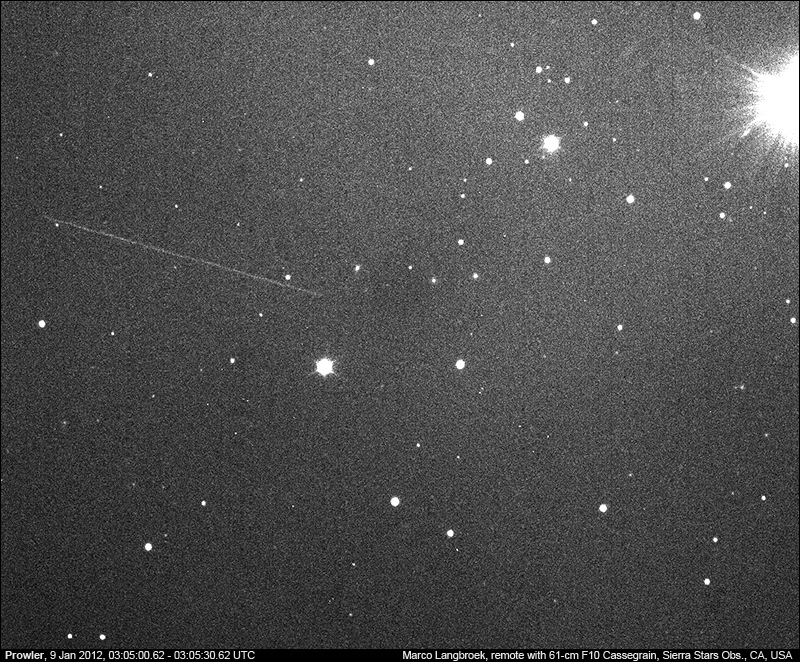 In one of the other images taken last Friday evening, another commercial geostationary communication satellite, Intelsat 4 (95-040A) was captured while it briefly flared brightly at about 18:58:30 UTC (27 Jan). The FIA radar and a number of geostationary objects (Mentor 2, Mentor 4) and the NOSS 3-3 r/b were imaged by me two weeks earlier as well, observations on January 14 and 15 which I had not reported here earlier. I also tried to relocate PAN, which recently has been relocated again but so far has not been recovered, although both Greg in South Africa and I in the Netherlands have tried. USSTRATCOM today (Jan 23rd) has finally released a traditional format final TIP for Phobos-Grunt. 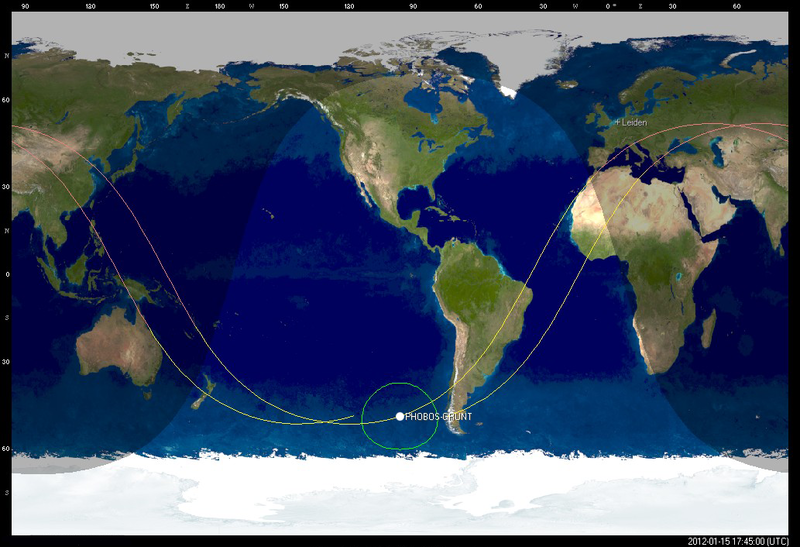 It yields similar values to the ones initially circulating through Russian press releases (see earlier post here): 17:46 GMT (+/- 1 m) and a location in the southern Pacific, near 46 S, 87 W.
It appears that the Russian news bulletins claiming that Phobos-Grunt reentered over the southern Pacific at 17:45 UT yesterday (see my previous post) rather were model predictions than reentry times based on actual final track detections. The Russians (nor the US, for that matter) actually do not have much in terms of tracking facilities in the indicated area (S-Pacific, S-America and S-Atlantic). This highlights the problem, and the similarity between the UARS case last September and the current Phobos-Grunt case. In both cases, determining where it came down was likely hampered by the final revolution and final half hour or more of its trajectory being largely over remote and empty territory. Specifically, in both cases: the southern Oceans. A lack of tracking facilities (and humans in general) in these areas, mean that they represent a large blind spot for those who's profession it is to track these objects. Once a satellite near decay starts to make its final passes and significant parts of that happen to be over these remote locations, it basically disappears into a black hole. 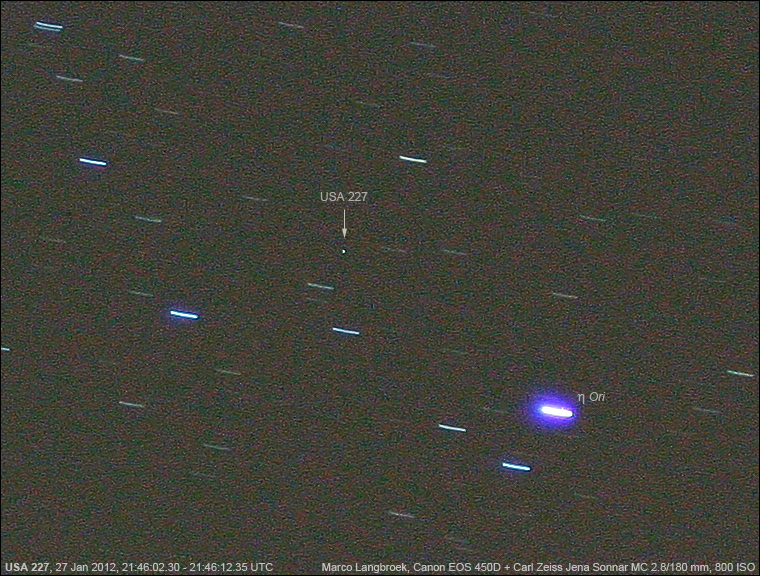 That's what happened with UARS in September, and what now happened with Phobos-Grunt. While some in the media and public have expressed frustration about the lack of published information (and the contradictory information) right after Phobos-Grunt presumably came down, I feel those people lack a realistic outlook on these matters. These people apparently expect that the military is able to determine a clearcut point of reentry within minutes after the satellite has reentered. In reality, this is not how it works. The military has intermittent detections when the object moves over tracking facilities, spread wide and far over a number of places around the globe. They do not have continuous coverage. They cannot track where they have no tracking facilities. And the big and empty southern oceans represent a large swath of Earth where that is the case. In Hollywood movies and TV-series, the military (or "NASA", even though in reality it is not NASA doing the tracking) are portrayed as having a second-to-second real-time tracking opportunity of objects, with a moving dot on the screen that disappears in real-time as soon as the satellite reenters. That however, as most things in movies, is a highly unrealistic view which has little resemblance to reality. It will take the professional analysts at USSTRATCOM and elsewhere some time to ponder the last tracking data, detections and non-detections, and maybe even then there will remain uncertainty about where Phobos-Grunt came down. Such is life, and reality. In the case of UARS last September, some of us have had some suspicion that Space-Based observations (Infra-Red detections by the early warning satellites of Missile Defense) were perhaps involved in the final determination of the point of reentry. These resort under another part of the military, and comments by those "in the loop" have indicated that normally there is little data exchange between these guys and the groundbased tracking guys. There is also the open question whether reentry fireballs are bright enough for these space-based systems (the DSP and SBIRS satellites) to detect them. As the specifications of these systems are of course classified, little is known about this. [Updated] Phobos-Grunt down over the southeast Pacific? Early reports in the Russian media report that Phobos-Grunt has come down over the southern Pacific Ocean at 17:45 UT (15 Jan). These same Russian media have misinterpreted decay bulletins in the (recent) past however, so this is all under some caveat until clear data from non-media sources (e.g.a USSTRATCOM TIP message) appears. The map above is a preliminary map based on orbital elements from 16:35 UT, an hour before the reentry, and shows the approximate position for Phobos-Grunt for 17:45 UT. There might be some small discrepancy between the pictured position and real position as it is based on orbital elements from one hour before the reentry. Update 20:40 GMT: USSTRATCOM released a TIP message at 20:34 UT simply saying: "Object Decayed Inside Predicted Window". That probably means: within the window of their earlier TIP message: 16:59-17:47 UT. 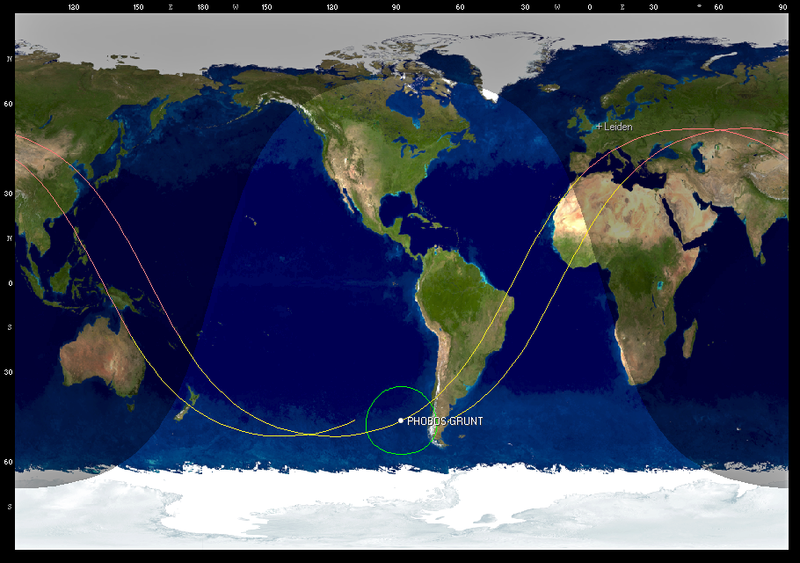 This could be taken to support the 17:45 UT value of the Russians and reentry over the S-Pacific. 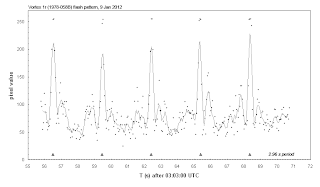 Listed are: source; time prediction was issued (UTC); predicted time and uncertainty interval, or predicted interval. My own current prediction, using Alan Pickup's SatEvo, current F10.7cm flux and 09:21 UT epoch orbital elements: 20:07 +/- 2 hrs. PLEASE take note of the still large uncertainty intervals. As yet, it is still impossible to realistically say where it will come down. Current predictions by various sources for the reentry of the failed Russian Mars probe Fobos-Grunt all still have a very large uncertainty window. Therefore, it is still impossible to provide any realistic statements about the when and especially where the reentry will happen. Suggestions in the press such as these only demonstrate a continuing and thorough misunderstanding of the whole issue among some journalists. 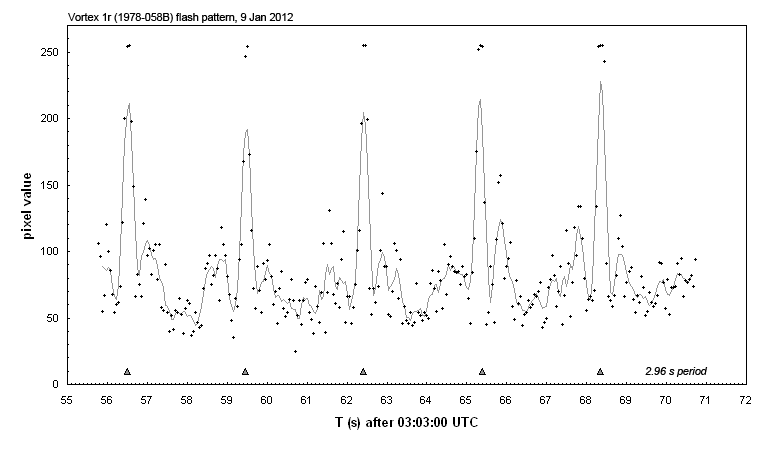 Perhaps as a result of this, USSTRATCOM has changed the way it presents it's Fobos-Grunt reentry predictions. While for other objects they still use the classical TIP format (time with uncertainty interval, and position at the nominal time), they altered the presentation for F-G: they only list the uncertainty interval, without positions or nominal time. Given the way that TIP messages were taken completely out of context and misinterpreted in the press recently (e.g. the notorious and utterly misinformed Novosti-RIA publication here), this is all a very understandable precaution. [added 15:45 UT, 14 Jan] My own estimate, using Alan Pickup's SatEvo and the current space weather (F10.7 cm flux) and the Jan 14.54 orbit, is for 15 Jan, 21:50 +/- 7 hrs UTC. PLEASE take note of the large uncertainty windows on all these predictions! The uncertainty amounts to many revolutions of F-G around the Earth, so it is impossible to even indicate a Continent or Ocean (as some media sources do) where F-G will end up, at this moment. Most of the predictions favour the 2nd part of Sunday Jan 15th. We are in for an interesting weekend, as the failed Russian Mars probe Phobos-Grunt is experiencing it's last days of existence. Gradually having come down over the past two months, it is expected to re-enter and burn up (but perhaps not completely) in the Earth atmosphere on Sunday or Monday. Several days before the re-entry date, it is still not possible (whatever some news outlets erroneously write) to pinpoint when and where it will come down. At the moment of writing (early Friday), the SSC prediction amounts to a still over a day wide window between 15 Jan 02:40 and 16 jan 07:40 UTC. Harro Zimmer's latest prediction is for Jan 15 between 9:00 - 15:00 UTC. Both predictions encompass multiple revolutions around the earth. Please note: all these time windows can still shift, depending on actual developments in space weather (solar activity) and other factors. Apart from a glimpse through clouds of the ISS on January 2nd (video posted here earlier), I managed to do my first observations of 2012 this weekend, in the evening of January 7 from Leiden and (using a remote telescope in the USA) on January 9. Conditions were not ideal on January 7th: a lot of moonlight and intermittent clouds. I observed the HEO object USA 200 (08-010A), but due to the moonlight interference the trails were weak (but good enough to get a few positions) and the pictures not pretty. For the night of January 8-9, I scheduled a few observations on a "remote" telescope, the 61-cm F10 Cassegrain of SSON in California. Target was Prowler (90-097E), an enigmatic object discussed here earlier. The image series on Prowler (I always take a series of at least three images at minute intervals, in case the object is a bit off from predictions) contained a flashing stray. 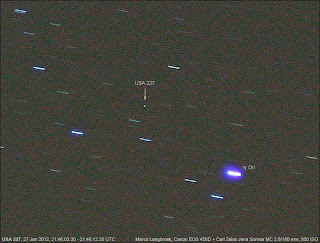 The main flashes are 2.96 seconds apart, and flanked on each side by slow secondary flashes about 0.47s before and after the sharp main flashes, giving the trail on the image a dash-dotted appearance. An iPad falling from "Space"? The video above is going viral currently, being posted on many news websites, Facebook pages etcetera. It shows an iPad being dropped from a balloon at a large height (100,000 feet or 30 km (19 miles)): and surviving. The video was released by the G-Form company, to promote it's "extreme sleeve" protective sleeve for tablets. 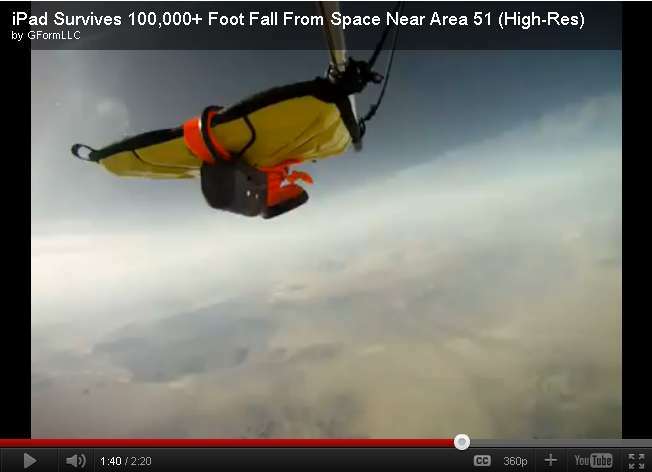 1) it does not drop from "Space" or even remotely near-Space, as is claimed. The international boundary of space is at 100 km (62.5 miles), while the USA (deviating from the rest of the world) maintains their version of the space boundary at 80 km (50 miles). Hence, with approximately 30 km altitude the iPad is nowhere near Space when it is dropped from the balloon. In fact, some military aircraft can and did fly at this altitude, for example the Lockheed A-12/SR-71 reconnaissance aircraft. This is the edge of airspace, but nowhere near true space. Analysing the above video carefully, one can note that after some intitial tumbling, the iPad stabilizes its orientation, and from a certain point on "falls" with the flat back towards the ground, level with the horizon. This is probably helped by the rigged cylindrical device on the back (the GPS tracker probably) and the metal rod attached to one end (that also holds the camera). The weight and position of these probably helps to stabilize the contraption. As a result, the iPad falls with the flat underside towards earth, i.e. maximizing it's airdrag. This slows the iPad's fall, it basically starts to develop some lift and acts like a wing. A good analogue is a falling leaf. It is no longer truely falling: it is rather gliding. Look at the screenshots below: this shows the stable attitude of the contraption. Look especially at the third screenshot, which shows the iPad just a fraction of a second before ground impact. As can be seen in picture 3, details of the ground surface (pebbles, plant stems) are not smeared at all in this single frame. Had the iPad hit earth at large speed, there would have been smearing and not this much detail visible in a single frame. The fact that all this detail is visible and hardly smeared, simply and undeniably points out that the iPad did not hit earth surface with high velocity. It shows that the iPad in reality glided down at relatively low speed, a speed of at best a few meters/second, similar to a parachute drop. 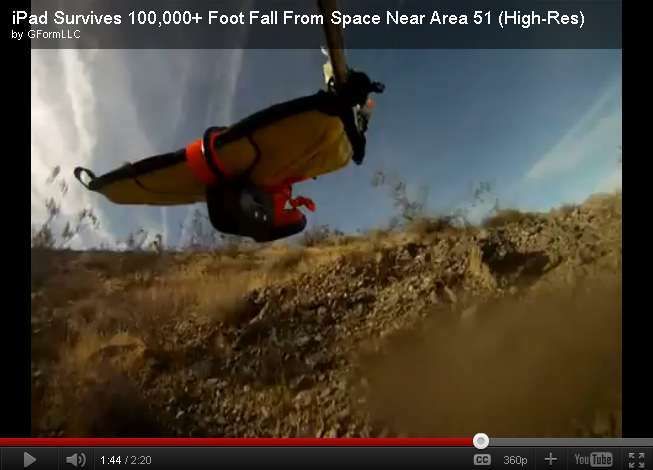 That is hardly a "hard landing" at all! It underlines that the iPad is gliding down gently, rather than making a true impact. The conspicuous lack of an impact pit is also a sign. It should be noted that the final part of the video with the landing appears to be sped-up, compressing a longer timespan in just a few seconds. Look for example at the fast movement of the aircraft contrail in the sky just after landing. This speeding-up of the video aids to give the impression of a "hard" landing, while in reality it was a quite gentle landing. So: this video is not entirely what it purports to be. 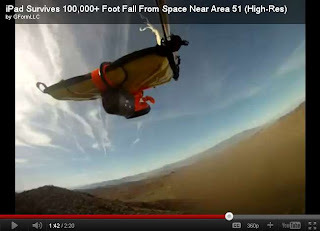 Yes, the iPad makes an impressive drop from a high altitude (but not from "near-Space" or "Space"). But no, it does not survive solely because of the protective sleeve. The truth is, that the iPad does not land with high speed at all. 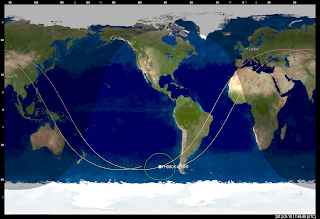 The evening of January 2nd started clear, so I set up the video to film another pass (17:01 UTC) of the International Space Station (ISS) which currently has the Dutch astronaut André Kuipers on board. Unfortunately, an episode with many clouds commenced just before the pass. I managed to film glimpses of the ISS through gaps in the cloud cover. Very frustratingly, it was completely clear again 10 minutes after the pass. On January 3rd, it was clear. ISS made a pass in very deep twilight (16:04 UTC), with the sun at an altitude of only -3.5 degrees! Nevertheless, the ISS was well visible by the naked eye, in a bright blue sky with no stars yet.